This book meme was created by Rose City Reader, where you share the first sentence (or so) of the book you are reading, along with your initial thoughts about the sentence, impressions of the book, or anything else the opener inspires. I haven’t started this book yet, but I’m even more excited now that I’ve read the first sentence. I’m dying for a great fantasy read, so hopefully this will quench my thirst. I’ve read reviews rating this quite low, and I didn’t like Taylor’s Daughter of Smoke & Bone (Daughter of Smoke & Bone, #1) . You can read my review of Taylor’s debut, here. I’ll be honest, the synopsis doesn’t intrigue me, but I’m hoping I’ll like it anyways. However, this first sentence has to be one of the best I’ve ever read! 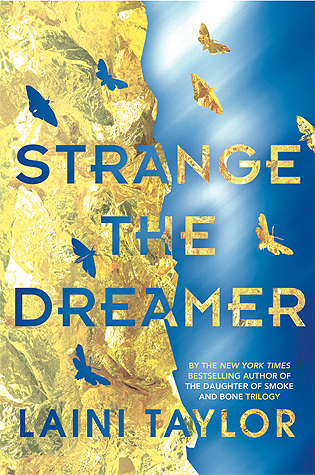 Which do you prefer; the US or UK cover for Strange the Dreamer? BOTH! this is one instance where they’re both just so beautiful, I can’t pick! and the book was really good, i totally enjoyed it although it is kind of confusing at the beginning, i recommend sticking it through because it’ll be worth it! it was magical and wonderful and I definitely enjoyed!